2 oz. tin of Cigar Blend Beard balm using only the finest oils and butters that are used in all G.B.S. products. This amazing balm helps to tame your beard reducing those pesky flyaway and unruly hairs, while deeply conditioning and protecting your manly mane! 1 (1 ounce) GRAVE BEFORE SHAVE GENTLEMEN’S BLEND BEARD OIL Contains all natural ingredients that condition, moisturize, and strengthen those precious beard hairs promoting healthy growth!! This product is also designed to help condition the skin under your beard to aid with dandruff and flaking, keeping your beard life comfortable…the way it should be! G.B.S. 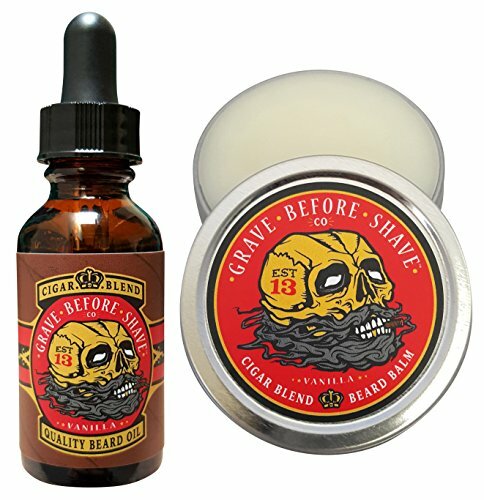 GRAVE BEFORE SHAVE Cigar Blend Beard Oil (Cigar/Vanilla scent) Contains all natural ingredients that condition, moisturize, and strengthen those precious beard hairs promoting healthy growth!! This product is also designed to help condition the skin under your beard preventing dandruff and flaking to keep your beard life comfortable…the way it should be! G.B.S. Cigar Blend Beard Oil has a rich Cigar scent with Vanilla after notes. Enjoy the spicy scent of a deep flavored cigar while keeping your Beard Hydrated, Healthy, and shiny!